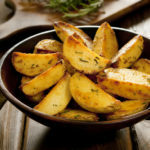 This Air Fryer Potato Wedges recipe is a guilt free way of enjoying the taste of fried potato wedges without all of the calories and health concerns of eating deep fried food. Crispy air fryer potato wedges – much healthier than deep fried wedges. One of the main reasons that I purchased our BCP 5.5 quart Air Fryer was to be able to enjoy the taste of ‘fried’ foods without the worry of it being cooked in a large batch of oil. I think most of us can agree that foods cooked in a deep fryer are delicious. In contrast, we all know that eating these type of fried foods are bad for our health. So when I purchased our air fryer, I was excited to see what foods I could reintroduce to our diet in a healthier way. 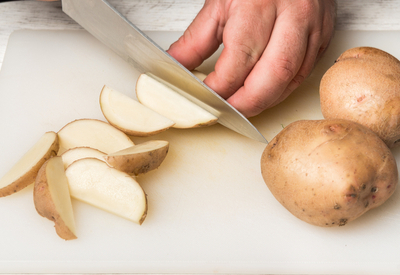 Slice your potatoes in even size wedges for best results. I immediately tried out ‘fried’ chicken tenders and the end result, delicious chicken tenders that were done and ready in less cooking time than expected! Crispy on the outside and tender and juicy on the inside. And most importantly, made without being cooked in a bath of hot oil! So we moved on to other recipes to try! We have made sweet potato fries, Chimichangas, jalapeno bites, apple hand pies, frozen hamburgers and many other recipes. All have turned out delicious and made in less time than traditional cooking methods! 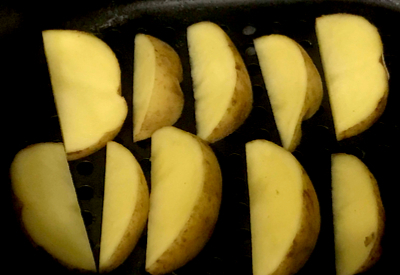 Evenly sliced potato wedges ready to be put in the air fryer. But one of our absolute favorite recipes is our Air Fryer Potato Wedges. They are cooked to perfection each and every time! Perfectly crispy on the outside, and soft and tender on the inside, but most noteworthy, they taste just like the ones that you order at a Steakhouse. You can sprinkle your favorite seasonings on them to change up the flavor to compliment a variety of cuisines. Potato wedges inside our air fryer basket, ready to be cooked. 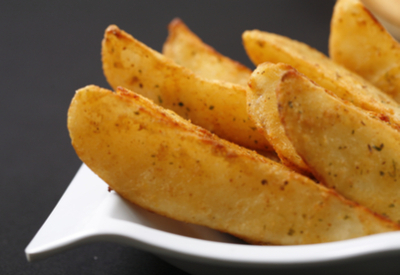 Some of our favorite Air Fryer Potato Wedges seasonings are ranch, Parmesan, garlic salt, seasoned salt and Cajun seasoning. Served on a platter with a little ranch dressing, hot mustard sauce or Sriracha sauce and your side dish is complete! Air fryer potato wedges served on a platter with our favorite sauce – Sriracha Mayo! Crispy on the outside, tender on the inside potato wedges that are cooked to perfection and are much healthier than deep fried potatoes. 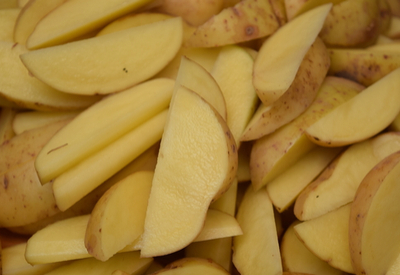 Wash and cut the potatoes into wedge shapes and place them in a large bowl. Drizzle them with a tablespoon of oil and toss until well coated. 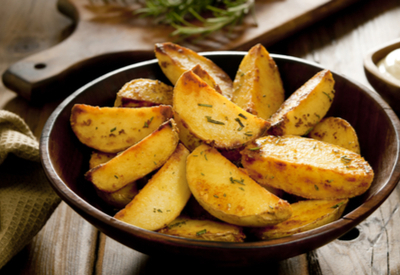 Preheat air fryer at 385 degrees F and place the potatoes in your air fryer basket for 25 minutes. Shake them 2-3 times during the cooking process for even cooking. Once tender and browned, remove from the basket and season with your spices of choice.